This is a third shot from my 52 Timelapse Project. You can check out the details of the project or full list of the shots. For some time I was looking for a good location for this shot. My demands were: a long, straight corridor or tunnel, where I’m able to shoot 🙂 It wasn’t that easy, but one day by accident my wife saw a photo of this beautiful, natural straight tunnel between trees, it was good enough for my plan and in my city. So, it’s a dolly-zoom shot, but a little bit different. Most of the vertigo effects are shot with a subject on the first plan, and this subject stays the same size for the whole shot. In this one, there’s just a straight path, nothing else. That way it can cause even more brain hurt that a regular dolly-zoom 😉 I’ve done such effect once, but it wasn’t my best try – watch it in the gif below. I wanted to include my wedding car – Fiat 126p in that shot, however the gate was closed. I still parked the car there, maybe some car-freak would notice 😉 The car had two tasks – to look good and act as my first fixed point. First thing I did when I got into location was to find a place/point, that would act as my second fixed point. You can be confused, because if you read my Hyperlapse Tutorial, you know, that one fixed point is good enough. But how the dolly zoom effect is made? 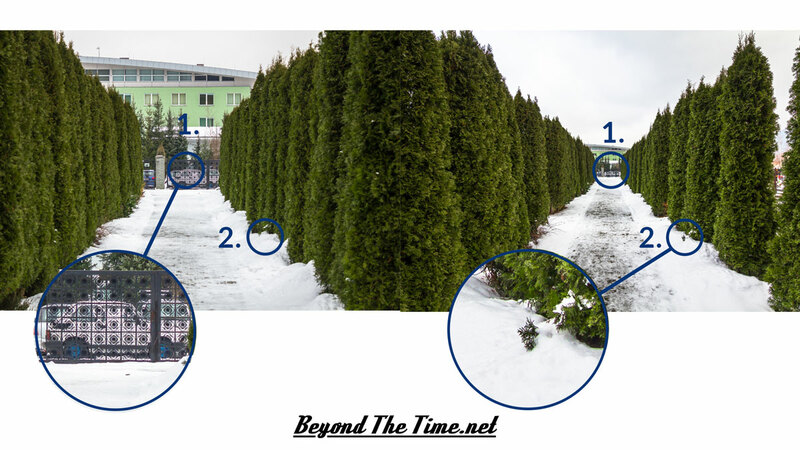 You’ve got to change your distance to some object, and change the focal length of the lens in the same time. So, you need to find some object that stays the same size during the whole shot. Look at the image below. The first point was the car (a small part of it) and it’s a çlassic fixed point – I follow that with the center of the frame in two axes – vertically and horizontaly. The second fixed point was a little bit different. That was the little green fellow that comes out the snow. I couldn’t just pick one tree, because they are all pretty the same 😉 I said that it’s a different point – I follow it only in one axis: horizontally. That means I choose one of the vertical lines of the live view grid and make sure, that this point is not moving left or right, always on the line. I don’t care if it changes the height. 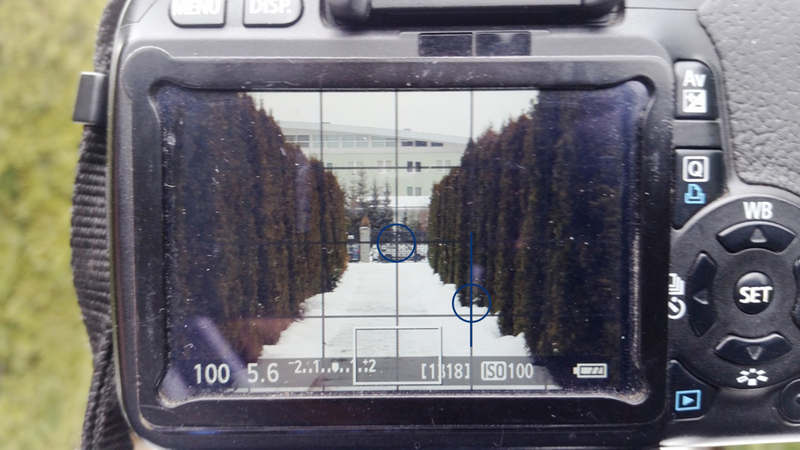 So, the shooting looked like that: I started with the 18-55 kit lens @ 55mm (the path wasn’t long enough to use a telephoto lens). I took the first photo, moved a little bit forward, positioned the center of the frame to the car, then zoomed out till the second point matched the grid line. And that’s all 😉 When I got to the 18mm I changed the lens to Sigma 10-20mm and matched the composition to get something around 18mm. Appreciate the series you’re doing, it benefits us all…I did a similar effect, all in camera during the shoot and did nothing in post besides toning. The clip begins at 1:04 and ends at 1:11 seconds.